Gori (Georgia). Stalin statue removed in dictator’s hometown. Georgian President Mikhail Saakashvili has approved the dismantling of the historic monument to Stalin in the centre of Gori, Soviet dictator’s birthplace, and rejected the accusations of attempting to rewrite history. “There is a museum nearby. In that place there must be the appropriate exposure. In our country there should not be at the same time museums of occupation and monuments to people whose initiative provoked the invasion of an occupation army,” Mr. Saakashvili said, alluding to the military conflict with Russia in August 2008. “It’s necessary to act with history in a civilized manner, without hysterics and vandalism”, he concluded. 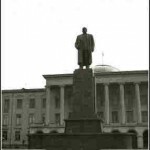 Stalin’s six-meter-bronze statue was removed during the night, so that in the morning the empty square in front of City Hall was a surprise to the townspeople. According to some of them, authorities simply tried to avoid protests, because local residents would prevent the demolition. Officials say the overnight dismantlement of the towering statue, approved last week by the city’s parliament, was spurred by the appeals of a younger generation who have embraced Western ideals of freedom. “Stalin was a political criminal involved in the invasion of Georgia by the Red Army in 1921 and in its occupation which lasted 70 years,” he explained. The removal of the monument to the Soviet dictator – erected in his honor in 1952, the year before his death, – makes way for the construction of a memorial to the fallen in the war against Russia in August 2008, when the town was shelled by Moscow’s military forces. Born Joseph Dzhugashvili to a peasant woman in Gori (80 kilometres west of Tbilisi) in 1878, Stalin ruled the Soviet Union with an iron fist from the late 1920s to his death in 1953.